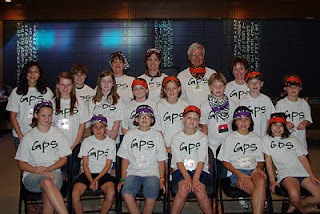 A mission experience for older elementary/middle school students. As I type this update, the kids (and adults) are starting to wind down and head to bed. We've had a great first day. Today has been a day of traveling - yes, Little Rock is a long way from NW Arkansas in a church van. It's also been a day where we've learned to work together as a group - the two churches coming together as one group - and we've made a few new friends. You would have been really proud to see your students, working together in the heat to quickly unload both vehicles and the trailer, and later in the afternoon, the pickup filled with our groceries (thanks to Melissa Freeman from Vilonia UMC - for volunteering to make our "huge" grocery run!) Because everyone worked together, a huge job was completed in mere minutes. Tonight also debut our "new" worship at the mission trip - thanks to the Rev. John Palmer (UCA Wesley Foundation Director) and his ministry partner - (um, forgive me for not remembering your name tonight - but she's a college student with connections to Springdale) - for coming to help us with our music. It was awesome and we're looking forward to two more nights of listening to John play the guitar! Each night we're talking about our P3's (Peaks, Pits & Prayers). Most of the students tonight struggled to find a "pit" (something that made them sad or discouraged). They all talked about making new friends, doing new things and well, being excited for tomorrow. We're off to the Quapaw Quarter United Methodist Church food bank in the morning - we're not really sure what we'll be doing, but it should be an interesting experience. In all, it's been a good first day. Thank you for your prayers.